Whirlpool 36" gas cooktop with 12,500 BTU Power™ burner, gives you more cooking power whenever you need it. 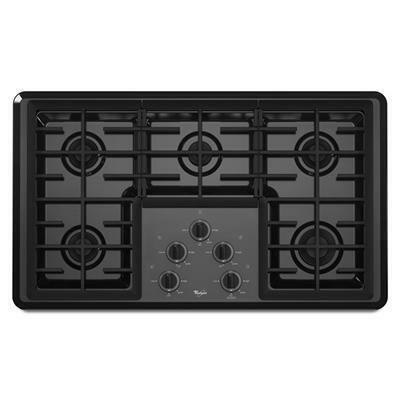 Features 5 sealed burners, porcelain-on-steel cooktop and dishwasher safe, continuous cast-iron matte-finish grates. Power Output -Right Front: 12,500 BTU Power™ Burner. -Right Rear: 9,200 BTU Burner. -Left Front: 9,200 BTU Burner. -Left Rear: 9,200 BTU Burner. -Middle Rear: 5,000 BTU AccuSimmer® Burner. Additional Information -Liquid Propane (LP) Gas Conversion Included. -Dishwasher-Safe, Continuous Cast-Iron, Matte-Finish Grates: Cast-iron, matte-finish grates cover the whole cooking surface, giving you the flexibility to place pots and pans anywhere on the cooktop. The easy-to-clean grates are dishwasher safe, and their matte finish resists wear and tear. -Dishwasher-Safe Knobs. -Built-In Oven Compatible: This cooktop is built-in oven compatible and can be installed over a single built-in oven for added installation flexibility. -Versatile heating power for quick boiling and easy simmering: Power™ Burners and Simmer Burners provide precise heating for big pots of pasta or delicate sauces.